Kage is still trying to figure out what’s happening in his uncle’s business that he inherited. After the beating he’d taken from Theo Brown’s goons and the discovery of his uncle’s journal, Kage has to make a choice between Jamie and their future together or finding out the truth. Jamie wants to be the man Kage needs, but how can he help him without knowing the truth? They are in a very difficult situation with lots of secrets and lies, only their love for each other can help them…but is it enough? 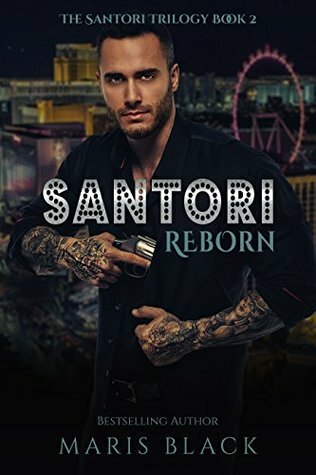 Santori: Reborn is book two of the Santori trilogy. The story starts at the end of book 1, and we keep following Kage and Jamie in their new life together. Kage tries to understand what really happens with the Alcazar and the inheritance from his uncle, and the only way is to be close to Theo Brown. His uncle’s best friend, his right hand, and the man who seems to control the “under business” of Peter’s, the illegal ones. So Kage, without really wanting it, and forced by Aaron (the bodyguard who helps them) must work with Theo, even if it means losing Jamie and himself in the process. I wanted to beat Kage more than he already was. He pissed me off to no end, really, the fact he accepts being manipulated by Theo and Aaron (don’t let me start about Aaron) and plays their game, pissed me off. I do believe that Kage is stronger with Jamie by his side. But I also understand why he’s ready to do anything to protect Jamie. So I refused to beat him and try to understand him. Jamie is lost, at first, but when he understood what Kage was intending to do and that he can’t change his mind, he did the most difficult thing he can…he protects himself first. I admire him for that, and I was proud of him. Jamie starts to be more mature than the young student he was in “Kage: Trilogy”. Then comes Peter, young Peter. I love this one. I’m still trying to understand how Young-Emo-Peter becomes Old-Coldness-Peter. His story is interesting to read along with his journal with Kage. For now, we’re still with young innocent Peter, in love with the handsome Gio Rivera. I couldn’t help but make a parallel between Emo-Peter and Jamie, they’re the same, this same innocence and kindness, while Kage is a kind of mini Gio Rivera. It’s completely brilliant from the author to create this parallel between her characters from 2 different timelines. I really loved this book, how the author put her characters in an area where nothing is black or white, when no one is really good or bad, it’s a universe of grey areas, when bad actions can be explaining by good motivation. I don’t know how it will end, how Jamie and Kage will still be together, but I’m sure that I’ll read it until the end, because knowing Maris Black, she reserving more surprises. It’s 5 brilliant OptimuMMs …. I want a fedora!